After a few false starts, I’m having fun working on my super secret project. Like many of my projects, one thing leads to another and I follow the breadcrumbs until I get to the end. I think it’s fine to share a few things as I go along, such as a creative resource that is proving invaluable. This resource is the book, Coils, Folds, Twists, and Turns by Tracy Jamar [© 2017 Stackpole Books]. Do you have this book? It is filled with amazing techniques and ideas for all sorts of projects. I wrote a review of it, which you can read here. The photo below shows my standing wool quillies, which will be part of the project. This is not really a hooking project, but as we rug hookers know, anything made with wool is fair game. I’ve torn 1 ½” strips and folded them before rolling. I like the soft edge this gives. I’m still deciding what else to start hooking. Sometimes I come to a pause and have to wait for inspiration. Maybe I’ll jump right into a Halloween project. It’s always the right time for Halloween, isn’t it? Or there are always the ferns and fiddleheads that are waiting. There's a lot of beauty out there and in playing with wool. Working on my hooked pizza is the closest I’ve come to wanting to cook food. It has been so hot and humid here in south central PA that the thought of cooking and creating more heat is out of the question. Having grown up in NJ, I should be used to hazy, hot and humid, but it’s a bit too early in the season for this. I mentioned last week that I’m using some of my many decks of divination cards to enhance my meditation and creativity. I had drawn three cards, which were really perfect. Angel of Painting; Whirlwind; and Orange. The Angel of Painting depicts my love of painting with wool, Whirlwind tells me that I need to mix things up and not be focused on one particular project, and Orange has long been my power color, which means Creative Energy. I will meditate on these three cards until I feel I need a fresh pick. Starting with my pizza toppings, I cut two wools for the standing-wool pepperoni using an 8.5 cut. One wool is dyed a dark rusty-red and the other is a plaid wool over-dyed a similar, but paler, color. I want them a bit taller to stand out among the rest of the pizza toppings, which will be in an 8 cut. At least, I think so at this point. I don’t plan every detail out ahead of time. I like to see how things look as I hook along. It makes the journey fun. I finished my Resistance Rug #1 this past week. I whipped it with a charcoal grey wool yarn with white slubs in it. It’s a Lopi yarn, which is my favorite yarn for whipping. It has a soft twist and fuzziness, which might not appeal to everyone, but with experience, we each find what works best. As always, I used cotton clothesline to give the edge a nice fullness. I just put this rug pattern on the SHOP page of my website. 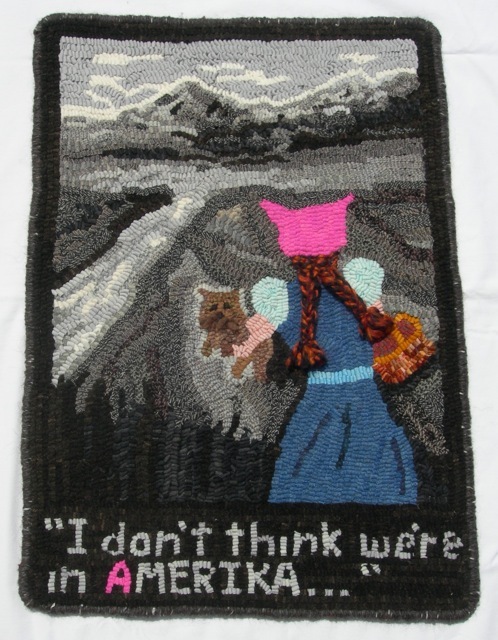 There will be another Resistance Rug in the near future. There’s a lot of beauty out there and in a variety of design projects. My three cards and the zen pizza. The pepperoni are finished and hand-sewn in place. If you'd like to hook your own Resistance Rug, this pattern is now available on the SHOP page of my website.